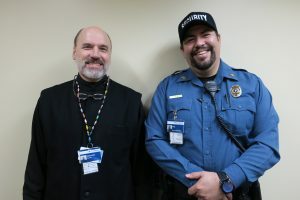 Fredrick Katelnikoff, a security officer at Providence Health & Services Kodiak, shares with Father Innocent Philo, the experience of being a former Village Public Safety Officer (VPSO) and the lessons that now guide him personally and professionally. VPSOs provide emergency assistance to rural Alaska communities that are sometimes hundreds of miles away from state services. In having to routinely depend on local villagers, Fredrick learned the importance of treating everyone with respect. Father Innocent: Now you told me a story, about working as a VPSO, that changed the way you work. It seems like that story impacts the way you live here. Tell me that story. Fredrick: Okay. As a normal VPSO you would live in your community and you’d have one village. Well, I was a roving VPSO, so I would travel every week to a different village. And so I quickly learned that I needed to be dependent upon people I’d just met for the very first time, or had, you know, met once before. I didn’t really know who these people were, know them to really get to know their personalities, if I could trust them or not trust them. I just had to, you know, rely on these people. So this was a different experience going into it where I’ve got to rely on somebody that I just met. But then I realized that also some of these people I had to arrest for certain crimes like driving under the influence or assault, that they’re from that community. And though they were arrested for a crime, they would eventually be released and go back to their home. Well, the next time I would come to that village, that might be the person I would need to rely on to help me with a search and rescue or help me with the firetruck or the equipment because, again, I did not live there. That made me realize that I had to treat every single person, no matter who they were, or why I was interacting with them, with the same level of respect and understanding because I didn’t know if that’s the person I would need in a months’ time to maybe even save my life. It’s very easy to be biased, and have biased opinions of people. I realized I couldn’t do that any more. I had to treat every single person exactly the same. That’s very humbling to think that, you know, every single person, regardless of why I interact with them, that I might need them changed my entire outlook on how I do my job as a VPSO and then that’s carried over to how I do my job now here at Providence. Father Innocent: So there was something you said when we were talking about how you’d treated everyone the same before, but something happened for you. Fredrick: Right, so before when we were talkin’, you know everybody was treated the same in the aspect that nobody was above the law. It didn’t matter if you were the mayor, the mayor’s kid, or who you were, if you did commit a crime I’d arrest you and take you to jail. They were a person but not a personality. They were not individualized. I was always professional, always professional, but I took it to a more personal professional level, I guess. Once you get to know the person you can actually start to, you know, gain respect for the person and not just what they do. It completely changed how I viewed people and how I did my job. When you add that level of, you know, knowledge, to the people you interact with and the people you work with, you’re going to have more respect for the people you work with and the people you’re caring for. Our job is just part of it, part of it is the mission and core values of Providence, and to be caregivers and to be here for our people. But I know that Providence has definitely changed how I live my life, how I view other people and how they do their job and live their lives, and so that’s really important.